Mahana TANZEEL Magazine is a Urdu and Islamic based magazine. It published on monthly basis and has millions of its readers in whole world. Tanzeel magazine have a number of health and spiritual articles. This magazine contains vast collection of Urdu Spiritual Articles, Homemade Remedies, Social Articles and much more. Furthermore, solution of problems have also been discussed in the light of Sharia (Islamic standards and laws). Article published in TANZEEL February 2019 Magzine edition are as below. It also contains many effective skin care as well as spiritual health tips. 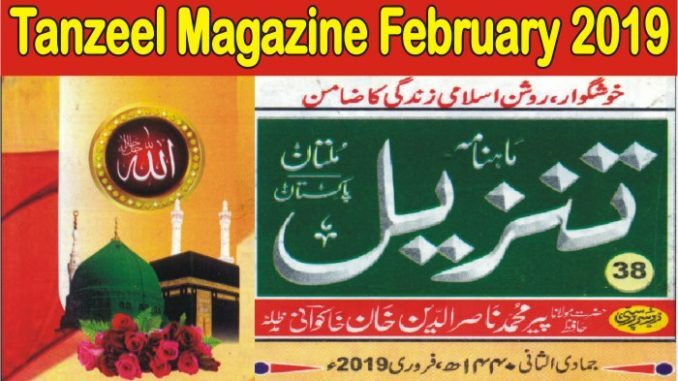 You can download TANZEEL February 2019 Magazine from link given below.